DATES: Loyd M. Bunyard was born ca. 1832 in Washington Co. Missouri. Loyd is the son of Samuel B. Bunyard and living at home in 1850. According to that census, he has attended school during 1850. Because he would have been at least 17 years old at the time, it can be assumed that Loyd was literate and, compared to the times, well educated. Loyd died of the measles on 15 April 1862 in St. Joseph, MO. It is unknown where he is buried. Joanna could have had the body shipped back to Rock Port or to his family farm and cemetery in Cherry Valley. However, it seems reasonable to assume that during the confusion and violence of the time, he was buried along with the other Union soldiers in St. Joseph. There is also a possibility that he was one of the many soldiers who were buried at the newly established National Cemetery at Fort Leavenworth where in the years following the Civil War, the bodies of Union soldiers from St. Joseph, Kansas City and Independence, Mo., were re-interred. 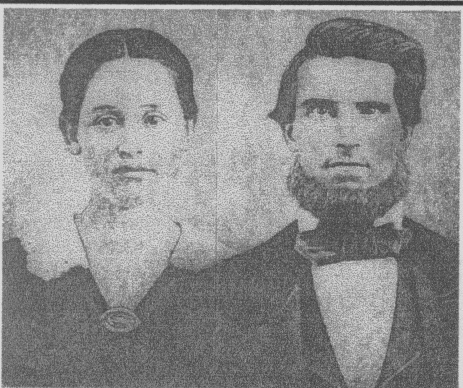 MARRIAGES: Loyd marries Joanna Jane Fitzwater on 2 March 1854 in Rolla, MO. Joanna was born ca. 1834 in MO. She is the daughter of Moses and Sarah Williams Fitzwater. The Fitzwaters are living in Johnson Twp. Washington Co. just a few miles north of Samuel Bunyard and his family in 1850. 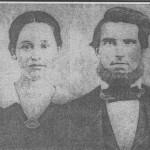 The Bunyard and Fitzwater families are already connected by marriage as Joanna’s Uncle George married Lloyd’s sister Celia in 1846. After the death of Lloyd, Joanna Bunyard remarries on 21 August 1962 to A. J. (Andrew Jackson) Abbott in Crawford Co. MO. It is thought that A.J. is the younger brother of Aaron Peter Abbott who married Lloyd’s sister Elizabeth in Crawford Co. on 7 July 1860. It is not known where Joanna was living marriage after her marriage to Andrew. Andrew and his older brother Aaron enrolled as privates into Co. F of the 32nd Regiment of Missouri Volunteers on 13 August 1862 in Steelville. [The same regiment into which John Bunyard and George Kenworthy mustered.] Jackson was mustered into the army 18 Oct 1862 in Rolla. Unfortunately, it is thought that Andrew died of disease on the River Steamer Memphis on 3 Feb 1863 thus leaving Joanna a widow for the second time. but it does not appear so. According to the 1870 census, Joanna has returned to Atchison Co.MO (where she lived with Lloyd) and appears to marry for a third time sometime between 1863 and 1866. Joanna is in the 1870 Federal Census, living in Nishnabotna Twp. in Atchison Co. Her Post Office is Rock Port. Her marital status is unclear. In the census, she is using the name of Bunyard, as is William. There also are additional children in the home, all under the name of Bunyard: Florence born ca. 1866 in WIS, and Sherman and Sheridan born Sept. 1869 in MO. The census states she “keeps house” and owns $200 in property. There is no mention of a husband or her marital status in the census. Has she married for a third time? It is thought that Loyd’s daughter, Mary, is living as a domestic in Rock Port. There is no mention of Elizabeth, who would have been 15 years old. QUESTION TO BE SOLVED: What happened to Joanna Jane Fitzwater Bunyard after 1862? HISTORY: Times were hard for all homesteaders during Loyd’s time. Missouri was divided on the issue of war, and farming, in the best of times, was difficult. Court records show that Loyd was no exception. Sworn 25 Oct 1860 is a suit filed by John Hall [Loyd’s neighbor in 1860] against ‘Loyd’ Bunyard for return of a “sorell or chestnut horse” and $25 damages. The Plaintiff attested that he loaned Loyd a yoke of oxen 21 Oct 1859, which the defendant, with Hall’s consent, traded for a 5 year-old sorell/chestnut horse in Feb of 1860. However, the defendant did not return the horse nor pay the sum of $60 by 1 Oct 1860 as agreed. Plaintiff was concerned the horse, valued at $100, would be lost or injured if left with the defendant. As a result of the filing, the Court Clerk ordered the Loyd to deliver the horse to John Hall and if he did not, the Sheriff was to take possession of the horse and summon Loyd M. Bunyard to appear before the Atchison County Circuit Court town of Rock Port on the fourth Monday in April 1861. What happened to the horse? This is not noted in the court records. Was this the same horse that is listed on Loyd’s enlistment papers and valued at $75? Private Loyd Bunyard enlists 13 March 1862 and is assigned to Capt. Rickard’s Co. MO State Militia (which became Company C, 5th Regiment MO State Militia Cavalry). Military records attach Loyd to 9th Battalion, Company C, 5th Reg’t Missouri State Militia Cavalry. His unit is organized at St. Joseph, Mo. during the months of March and April 1862. Loyd’s musters in 22 March and has a horse valued at $75. However, Loyd probably never had the opportunity to fight for his convictions. Camps populated by young soldiers who had never before been exposed to a large variety of common contagious diseases were plagued by outbreaks of measles, chickenpox, mumps, and whooping cough. When volunteers mustered for service, communicable diseases immediately struck down vast numbers of them. The first of the epidemics to sweep through the ranks was usually measles. In one Confederate camp of 10,000 men, 4,000 soldiers were stricken with measles, and the savage onset of the disease was something that astonished everyone, even the surgeons. The disease was so common and disruptive that new units were held back from active service until they had been “put through the measles”. Because men from urban areas were more likely to have been exposed to the disease at an early age, measles caused the most serious problem in units raised from rural areas. An epidemic of measles usually ran its course in three or four weeks, and while a person living under normal circumstances would usually recover with no lasting effects, in army camps the childhood disease often proved to be fatal. Sadly, 5,177 soldiers in the Union Army died of measles during the war. Loyd Bunyard was one of those soldiers. It is reported that Loyd Bunyard died 13 April 1862 of measles and congestion at in St. Joseph, MO. It would appear Loyd never left the barracks, for within 23 days of reporting he was dead. He had not survived being “put through the measles”. He was 30 years old and left a 4 year-old son, my great-grandfather, William Washington Bunyard. QUESTION TO BE SOLVED: Where is Loyd buried? Mary F. Bunyard born ca 1854 in MO. Possibly named after Joanna’s sister, Frances Mary Fitzwater. Elizabeth J. Bunyard born ca 1856 in MO. William Washington Bunyard born March 1858 in Mo.